I guess I'm going back to view Storrow Drive needs to be decked. Perhaps in a cheap way like some kind of roof not to hold buildings, but more like a covered bridge which would allow a viewer to think it it was a flood wall mound easily (So River|Park|Mound-that-really-has-cars-going-under|buildings). I was hoping a more seamless Pike connection in Allston and Ramps around Charlesgate (I still that a way should be found) would allow Storrow to be removed between Back St and BU bridge. Storrow can continue to distribute traffic off I-93 from the north into North Station, Charles MGH, and Back Street. But I guess a connection is still required and a Boulevard won't allow a seamless connection as the idea like the Back Bay Association had proposed. I rather have that than setting up cars to stop as lights and people having to cross those lights. The reason there isn't development on Back street is because the owners along Beacon street ensured that. Probably one of the reasons for Storrow's existence. I think a boulevard is the ultimate answer. What I want to see is increased connectivity, something that the current highway really fails at. Both for cars and people. Also the current highway isolates the Esplanade, making it dangerous at quiet hours. To fix that problem, we need to see less isolation of the park. A smaller version of the Embarcadero would do, I think. I would "west side highway" it from the Hatch Shell to the BU Bridge. Reduce it to four lanes, expand the median slightly to plant trees and allow parallel parking along the Back Street side to make people slow down. Then add grade crossings with traffic lights at Clarendon/Dartmouth, Goucester/Hereford and the Charlesgates. This would have to be done in concert with adding exits to the Pike to shift traffic there, as well as fixing the left turn issues on Memorial Drive that back traffic up for miles. 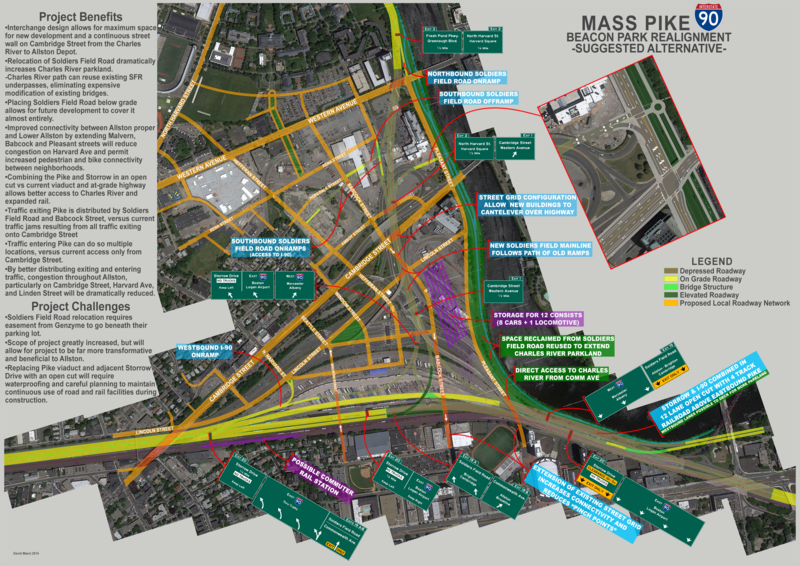 This is all, however, vastly out of scope of the Allston interchange project. While it should be designed in a way that allows for the future elimination/reduction of Storrow (my ramps to it could be converted to simple on/offramps), talking about it as more than a passing thought would get you laughed out of that meeting, likely by both sides. There are some areas on this road that could really stand some rehab work. Drive on it weekly going to Newton, and I can see where some of it, especially on bridges where it has been neglected and is seriously deteriorating! I'm not going to say anything, because this should hopefully be 100% self explanatory. If anyone notices any typos, spelling errors, confusing wording, PLEASE let me know. I want to send this out by tomorrow evening. 3 foot wide full resolution version. Incredible. Seriously, you should be working for MassDOT. My only suggestion is that there should be signage for vehicles carrying hazardous materials heading eastbound on I-90 to use Exit 19A-B. Hazardous vehicles are prohibited from traversing the highway tunnels in Boston. I'm not 100% sure what the restrictions are currently for I-90, but if vehicles must exit the highway in Allston-Brighton, it would be thoughtful including the signage in your proposal considering how far you've come with it so far. Excellent job, though. I think it's a great vision. My only other suggestion would be to feature an alternate overlay in the triangle bound by I-90, Cambridge St, and Babcock St in the event MA seriously considered using this site for an Olympic Village... and if that was the case, turning the "Storage for 12 Locomotives" into the "West Station" commuter rail station. * MassDOT wouldn't have exit numbers on SFR, it would just say "EXIT" or nothing at all. * All exit numbers in MA must be mile-marker based by 2020, so this project would have them from the start, probably. It's not a big deal, but it allows for you to give SFR and Storrow different numbers - 136 for SFR and 137 for Storrow. * It might be nice from a wayfinding perspective to have "Central Sq." and "Allston" on the Cambridge St/Western Ave. signs. You have Harvard Sq. on the other ones. Maybe just "Allston" if space is tight. Nitpicking, of course, but if you're going to include the signs, I figured I'd offer my two cents. Why not move the site of the possible commuter rail station in between Malvern and Babcock? However, you essentially are carving up Harvard's land. How does this design benefit Harvard? IIRC, from the IMP, Harvard (and the city) intend this land to be used for tech-related business and industry, a re-creation of Kendall. Harvard characterizes it as being developed in a private-university partnership. In that context, a long-term nexus probably exists between this property and MIT property in Cambridgeport, which is where I assume MIT will go next in development. I could envision a bridge across the Charles linking the two areas. I do not know whether Harvard has talked with BU about any BU interest in some of this property. A commuter rail storage yard should not occupy prime real estate. Is there still not a high speed left lane exit into a sharp curve? If so, unlikely to win approval. This would be a major design issue for trucks exiting the Piike to get to Cambridge. For all its elegance, this looks to be a billion dollar project. How would you feel about having two versions of this plan - Phase One & Phase Two? This would differentiate what needs to be part of this MassDOT project, and what elements are made possible by this MassDOT project but could be built later. For example, extending streets like Rena, Amboy, Windom, Seattle, and Hopedale, bringing Babcock from Cambridge St to Western Ave, etc. seem like they could be part of a Phase Two that are good to think about now but don't need to be built in this project. Separating this into two (or more phases) might make it less controversial in at least two ways. One is stellarfun's comment about carving up Harvard land, and second is the opposition that will come from residents of Hopedale, Windom, etc who don't want more traffic on those roads. Perhaps making Phase One more public and Phase Two less public would lead to more support and less resistance. >> A commuter rail storage yard should not occupy prime real estate. 3) Can Cambridge Street be reduced in width from its current configuration? I can definitely include that. I didn't even know about that proposal! 2) Outside the scope, but the project certainly does not preclude that. I could certainly include the connection on the map though, particularly if it would get some support from more people. 3) I believe I have it at 72' which is 7'Parking|7'bike|11'Travel|11'Travel||11'Travel|11 'Travel|7'bike|7'Parking. You could probably chop that down to 70' if you make each travel lane 10'6", but that can be worked out as the design progresses. It's only slightly wider than the section in Allston proper, and that width is to accommodate wide bike lanes. What would you think of the orange local streets that are 100% necessary to be extended to be solid, and then dashed lines for the streets mentioned above? Or would residents still flip out? Alternatively, I was thinking of having one ways reverse at Hefferan Street, so while residents living in that neighborhood could exit out, traffic could not get in. DO you think that would be palatable? They just extended a few existing streets through Charlesview by me over here, and it's been nothing but positive. As for Babbock, Pleasant and Malvern, extending them will be important for circulation of traffic not clogging up Harvard Ave and pedestrian connectivity, a large part of this plan. Or is it specifically Babcock you believe would be an issue? Harry, I really appreciate your feedback since you've got the ear of most Allston residents and a CRC board seat (which, btw, my instructor Jennifer Gilbert also sits on, the world's a funny small place). I did the signage primarily to make the project easier to understand for the general public rather than actual signs. It's how most drivers interact with the road. SFR being upgraded is why I used exit numbers, but of course they could be used however. While they will eventually switch to a mile based system, I decided to go with what people know. As for extra destinations, MUTCD suggests three or less destinations per sign, no more. Because of that and the fact this is more for presentation than actual signs, you've got the street names. See above, its more for presentation. As currently configured, I've got a fifth track for reverse moves out of the storage yard so trains running around the wye won't foul the main line where a CR platform would go. However this could be rearranged, the CR station could go there as well. What would you think about putting in two station locations and change the label to "Possible Commuter Rail Station Sites"? The "carving up" of the parcels above Cambridge Street are based off of Harvard's IMP, with a few changes. So it's what they want. They haven't released anything firm on their plans for Beacon Park, but anything needs roads. The blocks are still quite large and could support development. I doubt the grid would be all built right away anyway, its just a way to show the potential. Based off Harrys feedback I am probably going to be "ghosting" in the majority of those roads anyway. As for BU, IIRC they were in a bidding competition with them over the land and they lost, so there may be bad blood. A pedestrian bridge to MIT is always possible, but that's definitely outside the scope of this project. Honestly, there is a 2% chance that the yard will be built, it's probably going to be in Widett Circle or Readville. The MBTA studied it and it was included on MassDOTs two drafts, so I included it here. But that would almost 100% be developed. If you look closely, I dotted an orange line across the yard to drive the point home (perhaps not bold enough). What if I had the CR yard lighter, showed the road across it regularly, and labeled it "possible location for CR storage yard"? The only left exit is getting off the EB pike onto Storrow, and that's more of an interchange than an exit. Or do you mean where exit 19A and 19B split at Babcock? In that case there is a longggggg deceleration lane, although it could be modified if the curve is still too steep. Since I'm not actually a traffic engineer, I didn't calculate curve speeds, and simply based them off existing roads. Not only do you have phasing to consider here, but there's also the issue of jurisdiction. MassDOT is only responsible for the highway and the ramps, in addition to any overpasses over the Turnpike. The City would be responsible for constructing all the local roads (including Cambridge St), though Harvard would presumably pay for roadways on their property. DCR is currently responsible for SFR and Storrow, which is why none of MassDOT's proposals even approach the intersection at Cambridge and SFR - they legally can't alter it. Now, one could logically argue that if Storrow is pulled back from the river into Allston, that new road should be built and owned by MassDOT, but that would require transferring ownership of the road (or building a new road and giving DCR control over your Pleasant St. extension), and that would be a thorny political issue. Obviously, it's the right thing to do, as the entire highway office of DCR should have been rolled into MassDOT in 2009, but just be aware of the different ownership statuses and pots of money involved as you draw up a grand solution that breaks all the boundaries. Essentially, stellarfun, this may be a billion-dollar project, but MassDOT wouldn't be spending nearly all of that billion, and it wouldn't all need to be spent at once. I would make it as clear as possible (if you're not planning to speak) that the yard has virtually no chance of being built. Even "possible" is probably too strong, even though MassDOT has included it in their own plans. That's the kind of thing river people will jump on. Wow, what a nice, detailed layout. I especially like the signage you've made. Clear and easy to understand. How would you handle lighting? An interchange like this would need to be nice and bright so people can easily make out the markings and signage. Maybe explicitly mention Cambridge Street in the "Project Benefits" as something like "Transforms Cambridge Street into a neighborhood Main Street with cycletracks to the river." >> dashed lines for the streets mentioned above? Or would residents still flip out?...having one ways reverse at Hefferan Street, so while residents living in that neighborhood could exit out, traffic could not get in. That is a good solution, but it is another bit of subtlety and complexity in a plan that already has so much happening. While I don't know what exactly might cause residents to flip out, we are much more effective if we are together instead of having people attack this proposal because they don't understand it or think it will kill their peaceful existence. So I'd err on the side of showing much less (if any) extension of existing North Allston residential streets. I'd expect people to seize on the text for Windom and Seattle south of Cambridge Street and get excited (not in a good way). Same goes for Heffernan St (which Harvard calls and most neighbors think of as Stadium Way) - there will be Windom St residents worried about how that will affect them, so does it need to be shown? I would do more than ghost these. I think they should be removed from the plan. My comment about Babcock is that I think it should definitely be shown going to Cambridge Street, but in the Phase One plan I don't think it needs to extend north of Cambridge St.
>> putting in two station locations and change the label to "Possible Commuter Rail Station Sites"
Harvard is not paying for this project. The taxpayers are. So let's remember that. That's not entirely true. The taxpayers are paying for all the highway segments as well as local roads not on Harvard land. Harvard would likely pay for any roadways which subdivide its own property, even if the city builds them. Of course, that also means that they get the final say in how those roads run. We wouldn't even be having this discussion but for a quarter billion taxpayer dollars. The relatively piddling amount that Harvard is likely to pay for local streets is not comparable, and is to Harvard's direct benefit anyway. "What Harvard wants" will have plenty of representation, thanks to their clout. We ought to be worrying about what's best for the public, not what's best for Harvard.